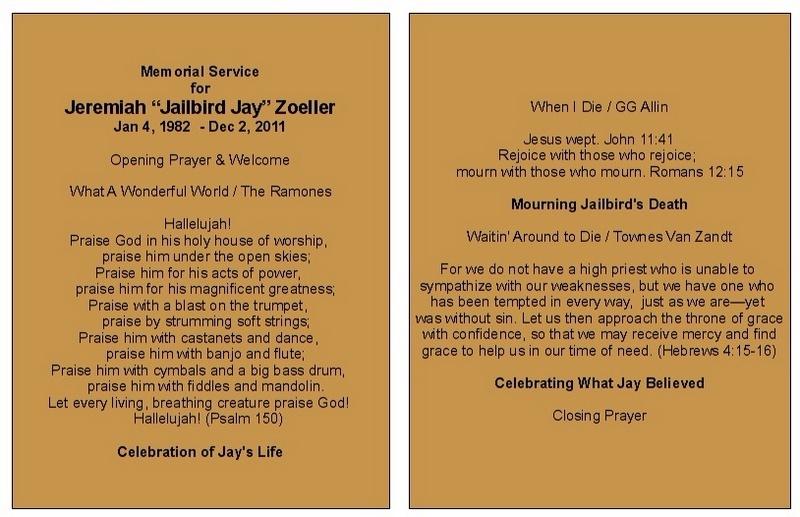 Jeremiah Zoeller, or Jailbird Jay, passed away in Austin after a day with friends. It was an ending he had seen coming many times, the outcome of living hard as a traveling street-dependent young person for many years. We began our memorial service by welcoming everyone, no matter how or if they knew Jay and no matter what they believed. We listened to a happy song that Jailbird would have approved: "What a Wonderful World" by the Ramones. I opened by reading Psalm 150, calling for people to praise God everywhere, including in open spaces–just like where we were holding our service on the grass under a tree. Psalm 150 calls for people to praise Him in every way possible, with all sorts of instruments including many played by travellers–banjo, drums, fiddle and mandolin. I asked people to share happy memories of Jailbird. Jay had pet names for many people, and they shared them. They weren't always flattering but each person savored their nickname today. Jay had partied with many, and they recalled some of the stories. Jay had taught some to ride trains. There was a story about how Jailbird developed a taste for a particular soft drink to go with his drink, and it had caught on among his friends. The stories went on. We then considered our loss. We listened to GG Allin's "When I Die." It's definitely a sad song in many ways. Then I read "Jesus wept" and "Rejoice with those who rejoice; mourn with those who mourn." One person asked, "Why should I mourn." I answered, "It's a great question. I read that passage–shortest verse in the Bible for those of you who like trivia–to try to explain. Jesus wept for his friend's death. And that's weird because just a few minutes after that, Jesus raised him from the dead. Now if Jesus is who the Bible says he is, I think it's odd that he cried knowing he could raise him. That tells me there is something very important about mourning the loss of a loved one with other friends. It doesn't take away from the joy of our live with our friend… it adds to it." One friend admitted being angry that Jay is gone. Another admitted being pissed because they can't bring him back. Many admitted to being regretful that they couldn't party with Jay one more time. Others talked over how they miss their friend. We returned to celebrating Jay by listening to a final song, "Waitin' Around to Die," by Townes Vann Zandt. I shared Hebrews 4:15-16, explaining that Jesus understands all our temptations personally and still has mercy for us. We considered how Jay lives on in our hearts and memories and how we can go on, too. There was talk of special tattoos so they won't forget Jay. There was a suggestion of remembering Jailbird each time they drink. There was talk of not wanting the pain of loss to fade away for fear of Jailbird's memory beginning to fade, too. As friends continued to swap stories, seated on the ground in several groups, we served a fellowship meal of Rudy's Bar-B-Que sandwiches, macaroni and cheese, and potato salad. We had cookies for desert. We shared donated dog supplies, fresh socks, toiletries, sewing kits and floss, clothing and other helpful items. As we talked, I asked how I could be praying with people there. "For a job. To keep my job. That I stay out of jail. For safe travel. That I find my road dogs. That I don't forget Jay. That I grieve well in the coming days." One young man whom I just met, a new traveler from up north, shared that his brother passed away earlier this year. He was reminded by the memorial and was thankful for him and missing him. All street youth experience many losses… too many. We will do another memorial next week for a young girl who passed away in Austin. Before we left, everyone pitched in to clean up the church that hosted our service. Though this will not be the last memorial service for a street-youth client, this is potentially the last memorial service on the "grassy knoll" for some time. The knoll is being used as the construction office for a new apartment building complex being built on the parking lots next door. Jailbird and I talked many times on that grassy knoll. He didn't like me at first, and I found him to be very prickly and ornery at first. However, we grew on one another over time. He decided I wasn't all bad, and would even talk about faith issues from time to time with me. I'll miss you, Jailbird, as will all those people you blessed over the years with your wit, your arguments, your horseplay, and your friendship. It is so easy for a youth to get caught up in street life and even to convince themselves that the street is where they want to be and that it is not so bad. This is a straight up lie of Satan. You can ask many youths and they will tell you that they chose and like the street. There is some truth to that. Yes, there are aspects of the street that are appealing – the adventure, freedom, lack of what society calls responsibility, etc; and yes, some of the choices they make keep them on the street. However, there is a deeper reality to the reason they initially became street dependent. It is this reality, this separation from “normalcy,” family, happiness, society, etc and the memory of what used to be (despite the fact that what used to be may not have been necessarily a physically, emotionally, and/or spiritually healthy place to be) that keeps them nostalgic and possibly even hopeful. Still, this nostalgia is a complex thing. For, as previously mentioned, a youth’s past “normal” life may not have been healthy; it may have consisted of abused, neglect, and extreme crisis. Therefore, what keeps one youth hopeful may be what keeps another bound to the street that separates them from that pain. As someone who is part of the street youths’ lives, it becomes an even more complicated thing to figure out how to help the youth to stay separated from the hurt of the past and at the same time to separate them from the street that continues to hurt them today. Complexity continues to arise as a youth longs for who they used to be over who they currently are. Although who they used to be may be housed up, in relationship with family, and a part of society, this person of the past is possibly just as broken, self-destructive, and desperate as the street person is today. What we need to help the youth realize is that who they used to be and who they are today are not the only two options for the future. New constructive behaviors, healed relationships, brighter dreams, stability, and abundant life are all realistic options for the future. Nostalgia may not be a bad thing; what would it look like, though, if a youth began to think in terms of a fully restored future self rather than nostalgia?